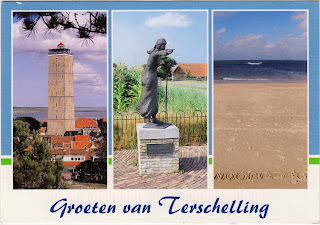 Postcard NL-2209353 arrived yesterday with greetings from Terschelling Island in the Northern Netherlands. 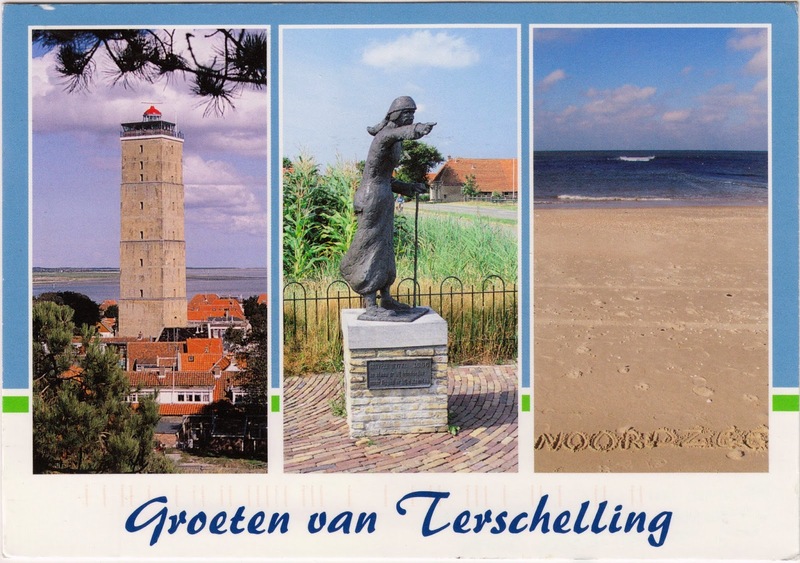 Terschelling is one of the West Frisian Islands, home to about 8300 permanent inhabitants. However, the number of people can triple in tourist season. On the left it shows square-shaped Brandaris, known as "the Tower" by local, the oldest functional lighthouse in the Netherlands. The lighthouse was built in late 16th century. Unfortunately, the interior is not open to the public. The middle panel shows a 1982 Statue of "Het Stryper Wyfke", an old lady who deceived English troops and saved the island from burning down during Holmes's Bonfire in 1666. She made English troops believe that the silhouettes they saw in the distant where soldiers, while in fact those were of graveyards. A section of beaches can be seen on the right, with "Noordzee" (North Sea, the open ocean outside the island) written in the foreground. Terschelling is separated from the mainland by the Wadden Sea and can be reached by ferry from the mainland Frisian town Harlingen in 2 hours and from Vlieland by high-speed catamaran in 45 minutes.